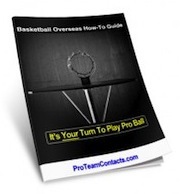 Make contacts with players, coaches, agents and teams in the most trusted website online! Make contacts with players, coaches, agents and teams in the most trusted website online! Find basketball jobs, prospective clients, post jobs, exposure camps and video.Learn how to play professional basketball! Free image storage & bandwidth forever. Whether you are straight out of high school, college or a season professional veteran, getting your basketball profile online is important. Put your best foot forward and get your name out there. Coaches and Agents alike can list their experiences and talent pool. When your basketball profile is complete you are ready to connect!! Share and discover your basketball profile. Connect to a worldwide basketball community! Do NOT give up on your dream. Basketball Connect is about showcasing your talents!